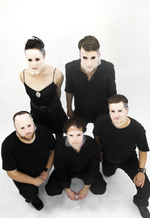 Cavedoll is: Camden Ray Chamberlain, Josh Wells, Zak Mason, Van Christensen, and Allison Martin. With help over the years from lots of lovely people including: Vanessa Angulo Chamberlain (especially), Ryan Petersen, Jamison Wilkins, Van Christensen, Jake Emery, Jason Steadman, Kevin Ivers, Randy Herbert, Jason Rock, Josh Emery, Allison Martin, Janet Chotia, Lindsay Heath, Gentry Densley, Denson Angulo, Ryan Milligan, Mike Sasich, David Fetzer, Patrick Fugit, Ian Aldous, Christy Cloward, Scott Fetzer, Alex Pappas, Tim Burgess, Jud Powell, Mark Kendall, Janet Chotia, Colin Short, Aaron Nelson, Allison Martin, Willis Clow, Josh Payne, and others. NPR.org, May 8, 2008 - " Cavedoll is prolific, almost to the point of absurdity. The neo-new wave group from Salt Lake City, UT has released 13 albums in the past year, with a total of ten albums due out in 2008. At the root of it all is the hyper-active imagination of frontman, producer, composer, and multi-instrumentalist Camden Chamberlain. For Cavedoll's latest release, No Vertigo, Chamberlain and the rest of his band serve up a hip-shaking burst of feel-good energy, inspired by '80s synth pop, electronica and punk. The album opens with the infectious and explosive "Decoder," with a driving synth bass groove and Chamberlain's crooning voice singing, "you know you want it!" "'Decoder' was inspired by the big, dancey mash of music I was listening to at the time, spanning several decades," says Chamberlain. "The lyrics and music are meant to reflect the over-sexed mindset of someone who is caught up in the speed and chaos of modern city life." No Vertigo takes a slightly darker, Cure-like tone on songs like "Cut in Half" and "Soma E Coup," while tracks like "The Past That Was" and "Now Is Our Time" are quieter and more introspective. But the urge to dance is still there." During the summer of '08 NO VERTIGO broke into the CMJ TOP 200 charts. Singles from the album are being featured on various samplers including The Planetary Group's STRANDED IN STEREO Vol. 10 and MAGNET MAGAZINE's September issue to name two. Cavedoll also recently signed licenses with various TV shows on networks such as MTV, E!TV, Oxygen, Bravo etc. Cavedoll can currently be heard on MTV's "Paris Hilton's New BFF' and BRAVO's "NYC Prep".